I’m really happy that my “Bulul” piece (acrylics on paper) and two small bulul studies done in my “fuzzy” sketchbook, have found a home with Elsa Valmidiano. A few months ago, Elsa published “Bulul” in her website, Slicing Tomatoes, with an excerpt from her novel-in-progress, “The Last Hunger.” I was honored to be one of the many pinay artists featured there. Bulul (or bulol), also known as tinagtaggu, is the name for indigenous Ifugao carvings (often appearing in female/male pairs) that represent, and embody, Philippine ancestor spirits that are placed near rice fields as protectors and symbols of fertility. 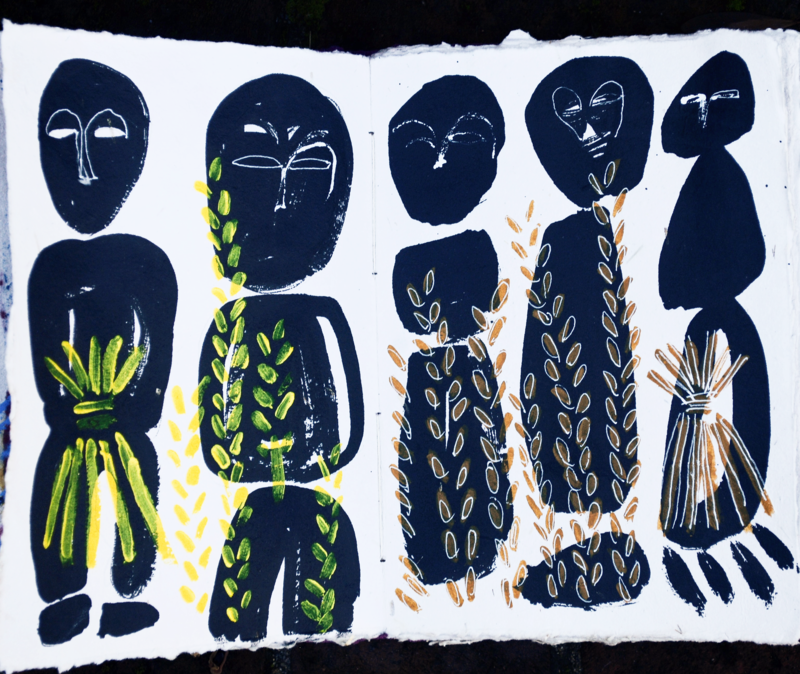 Raised in the U.S., I grew up far from Ifugao rice fields, and these paintings are my way of trying to envision and understand this expression of Philippine culture. True to what I’ve heard about studio visits, I learned something useful in the process. I learned the extent to which the presentation of your art on a website can influence the viewer’s perception of the art. My paintings appear in a portfolio page as “thumbnail” images that make the art look small; Elsa was surprised that the piece was in fact much larger than she envisioned it. “Bulul.” Acrylics on watercolor paper. 30 x 23 inches. 12/2017. Also, studio visits can spark ideas. When I brought out the bulul studies and showed them, I suddenly realized that I would love to make some linocut prints of bulul. I’ve been turning that idea around in my thoughts ever since, and will soon try some experiments. Two Bulul Studies. Ink on sketchbook paper, 1/28/2018. Jean Vengua. Bulul are usually carved in wood, ideally narra wood. I wonder if their ancestor powers can transfer over to paper which is, after all, made from wood. In any case, I like the idea of these bulul standing gentle watch over whatever home they enter. I’ll be holding an Open Studio at 641 Jefferson St. in Monterey on Sept. 29/30, 11-5pm as part of the 28th Annual Monterey County Artists Open Studio Tour. Stop by our gala opening on Friday, 9/21, 6 to 8 pm, at the Walter Lee Avery Gallery, Seaside City Hall, 440 Harcourt Ave., Seaside CA.